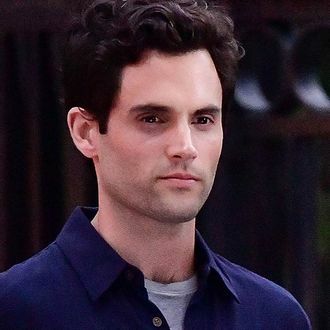 Penn Badgley’s next project seems like something right out of Lonely Boy fan fiction: In Lifetime’s You, Badgley plays a bookstore worker who stalks a pretty, aspiring writer’s social media to orchestrate running into her and sparking a romance. Sound familiar? When TV Line asked Badgley about the similarities to Dan-as-Gossip Girl’s tactics with Serena, he waxed poetic on the CW show and agreed. “I have no interest in ignoring the ways in which [Dan and Joe] are similar, or any of the comical parallels between the two,” Badgley said. “If anything, to the degree that there is any parallel between this role and Dan is the degree to which I get to sort of live out these twisted fantasies that I always wanted to. And that’s that. As much as people want to connect those dots, they’re welcome to, and I’m sure they will.” Badgley said he didn’t entirely get the whole Gossip Girl phenomenon — “Best. Show. Ever.” and all that — but looking back? “It’s a big defining thing in my life, so it’s like, how do I feel about Dan? How do I feel about Gossip Girl? I love them all,” he said. “Sometimes you turn the most scrutinizing eye on the people and things you love the most.” Aww, xoxo.